Contact us for Swaying or Leaning Poles, Lighting Pole Foundation Renewal. We'll Explain how we do it - Economically! Swaying Lighting Poles? The concrete foundation required to handle a tall lighting pole must have Safety First thinking and follow professional standards at the very beginning. Lighting poles must be able to sustain hurricane force wind and be able to sustain a vehicular accident without falling on someone nearby. 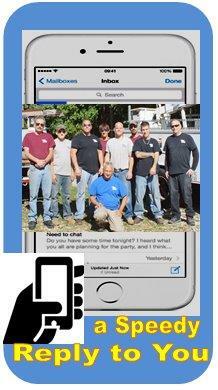 Many times local code enforcement is avoided. 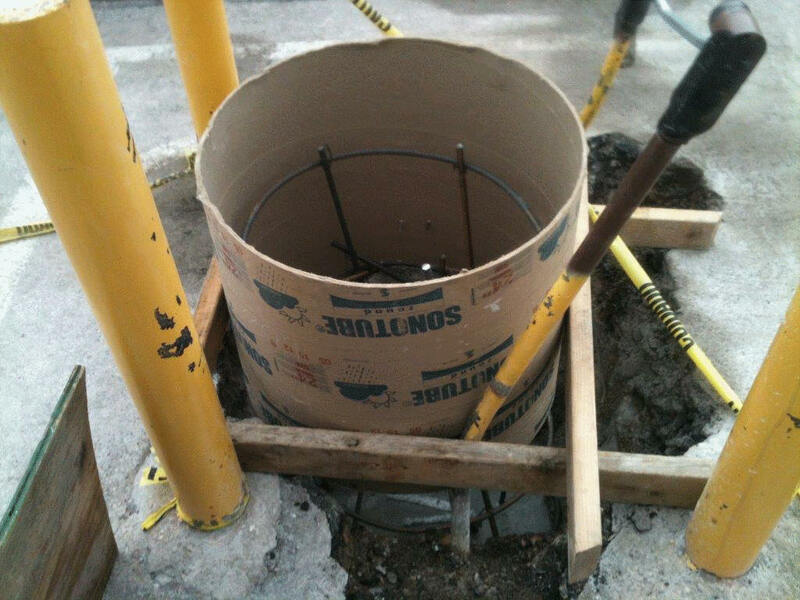 The proper installation of parking lot lighting pole foundations are unknown to most concrete workers. There are too many cases where economical short cuts are made by those unaware of what may happen under abnormal situations. 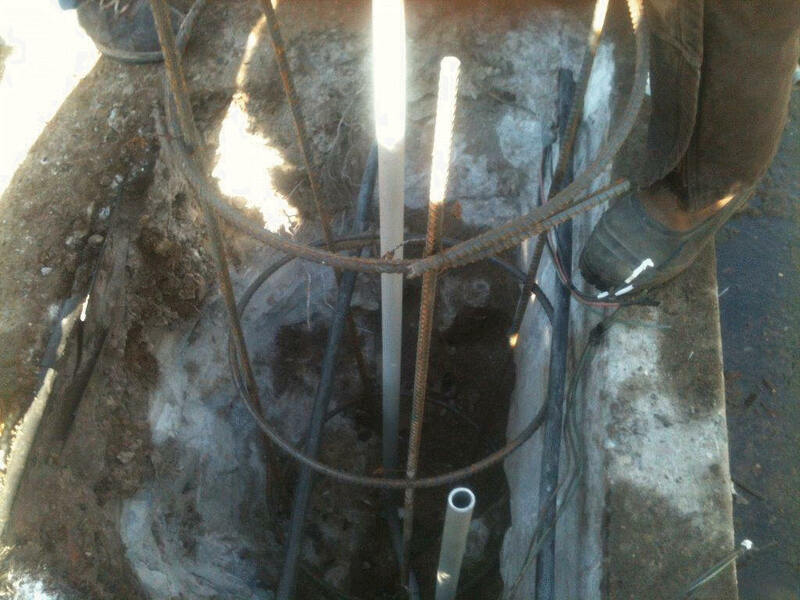 Lighting pole foundations must have the correct design, diameter, height, proper steel rebar reinforcement, proper electrical conduit and mounting bolt installations. This page shows some of our experiences and a way to point out what is wrong and what is right in prioritizing Safety First. 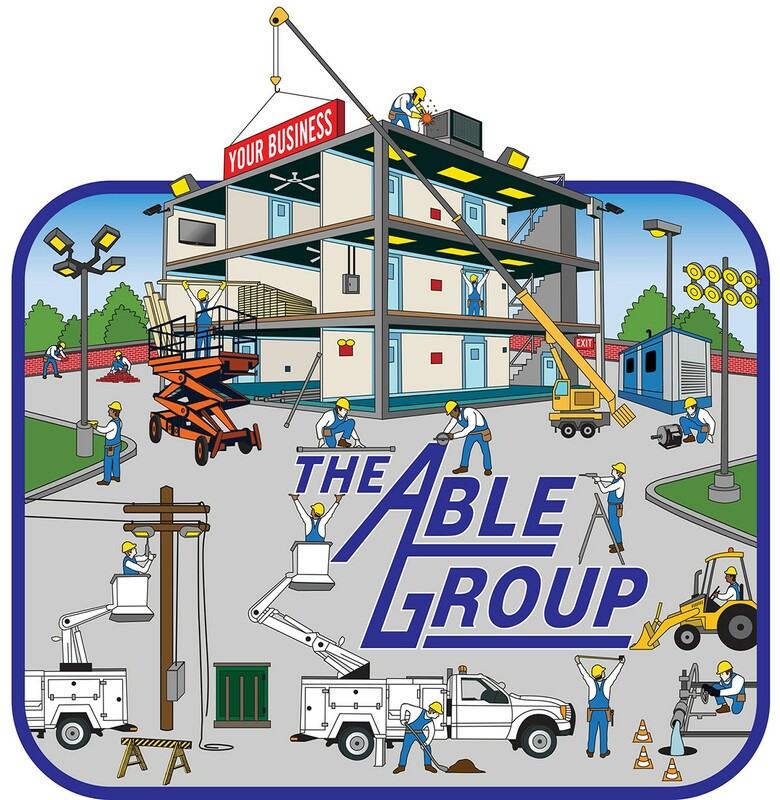 Contact - Able Group Inc about it. Call us if you seem to have a loose pole. Poles which seem to be moving due to wind probably could be an accident ready to happen. Look at the top to note it swaying in the wind. Also check the concrete foundation to see if the bolts are tight. 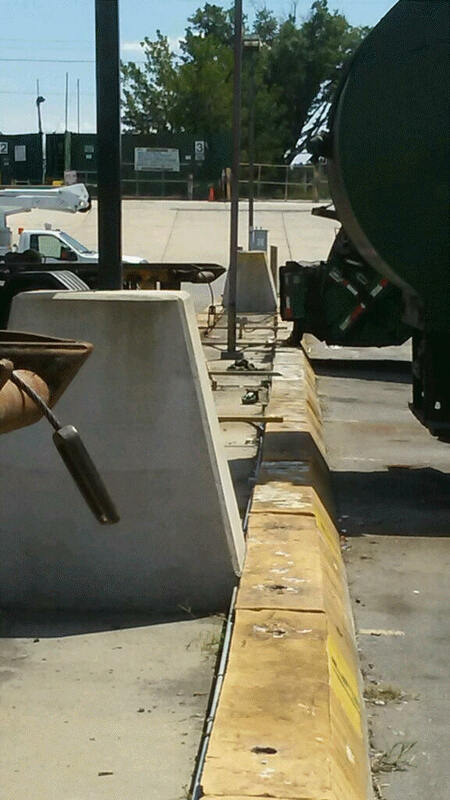 Light poles must have air space between the bottom mount and the concrete. Short embedded bolts are the reason for improper pole mounting. Only a professional pole service company should be considered to solve problem with swaying lighting poles - and that is US. Double nut mounting of parking lot lighting and sign poles must be priority. 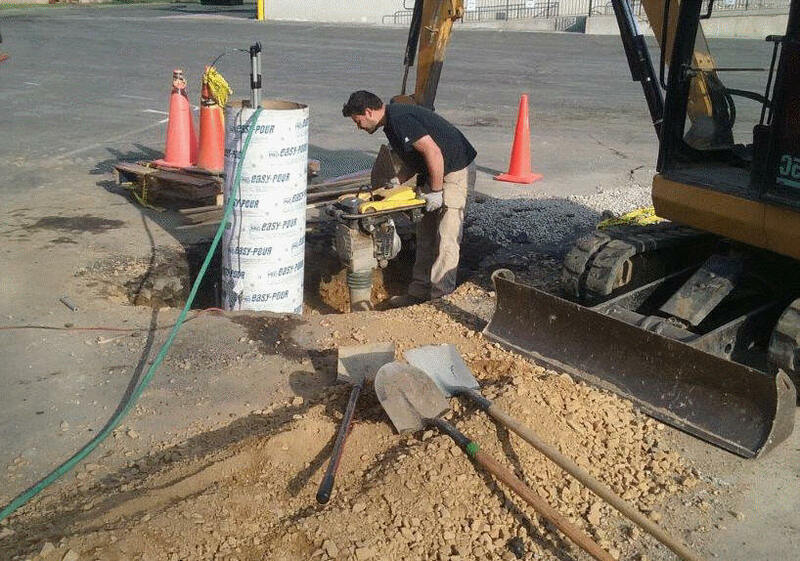 Contact Us because we service, Delaware County, Philly, Philadelphia, PA, NJ"
Ask us for more information related to Lighting Pole Foundations. This problem is found too often. This mistake was made before the concrete was poured. Poles should not be bolted down directly to the concrete foundation. Swaying Poles - this is most often the cause. The only solution is to cut the top of the surface down for the sole purpose of exposing good threads for "double-nut" mounting. Note the damaged threads made from the swaying pole. Spacing Test for remounting the pole. The stack of washers indicate the thickness of the bottom plate PLUS the washers needed for mounting. Re-check the alignment of the embedded bolts in the event they were installed crooked. Concrete foundations can move out-of-level for many reasons. This situation appears to be completely natural due to lack of proper excavation backfill during the original installations. Original bolts soaked with solvents and prepared for thread cutting renewal. Original bolts "re-cut" Embedded bolts made as good as new. The bolt renewal will now allow the proper double-nut mounting. Original bolts with the proper "double-nut" mounting. The foundation being out of level will not matter. This foundation should not have broken. NOTE: there are no reinforcing steel rods. This foundation should not have broken below the ground. This is due to lack of reinforcing steel rods. 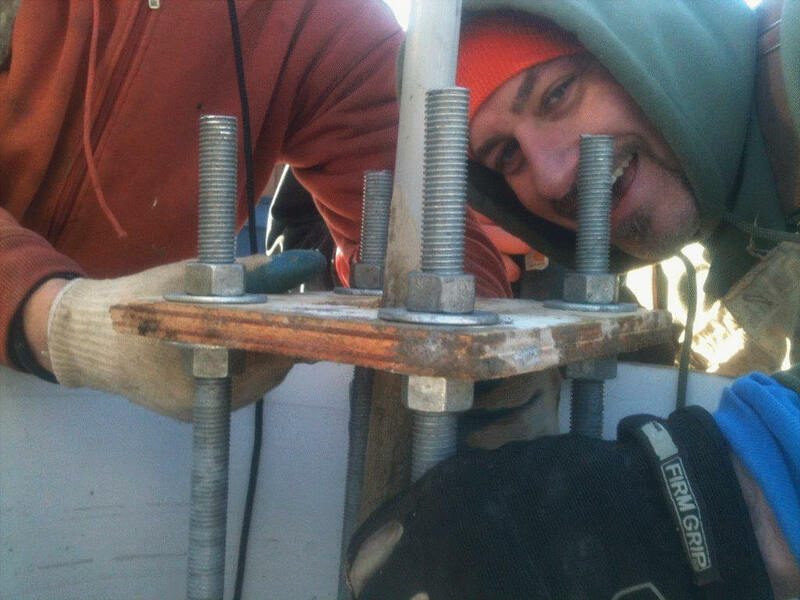 This is the proper method of rebar steel rods for the inside of a good foundation. 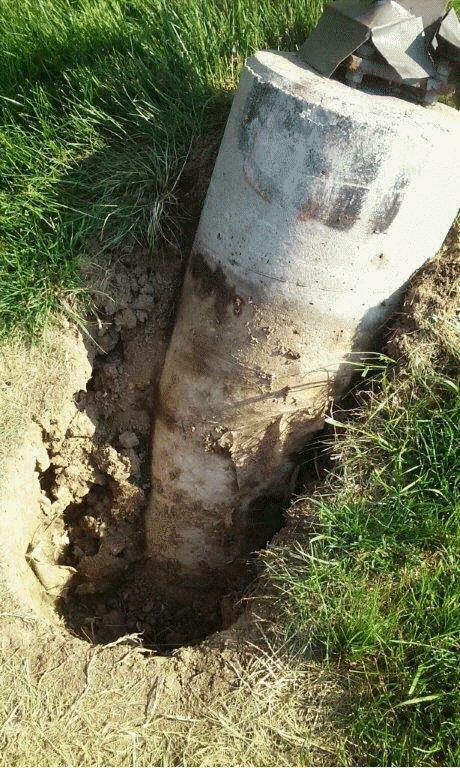 Lighting Pole Foundation to replace existing. Note rebar for horizontal and vertical steel rods. Vertical and horizontal rods required before the form tube. Lighting pole foundation in an area having a concrete sidewalk and concrete curb. Vertical and horizontal rods required. 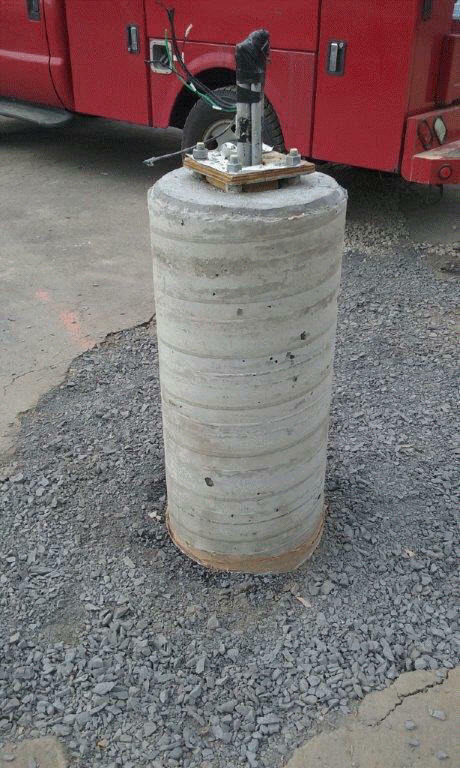 Bollard posts due to high hazard area. Lighting Pole embedded mounting "L" bolts showing the base template required for the concrete pour. NOTE: upper and lower hex nuts. Lighting pole foundation proper compacting using a jumping jack. Compacting the crushed stone used as backfill around a new parking lot lighting pole foundation. Showing stub-up conduits, embedded mounting bolts and vibration concrete finish. Lighting pole foundation made ready for the pole fixture and ready for the blacktop area re-surface work. 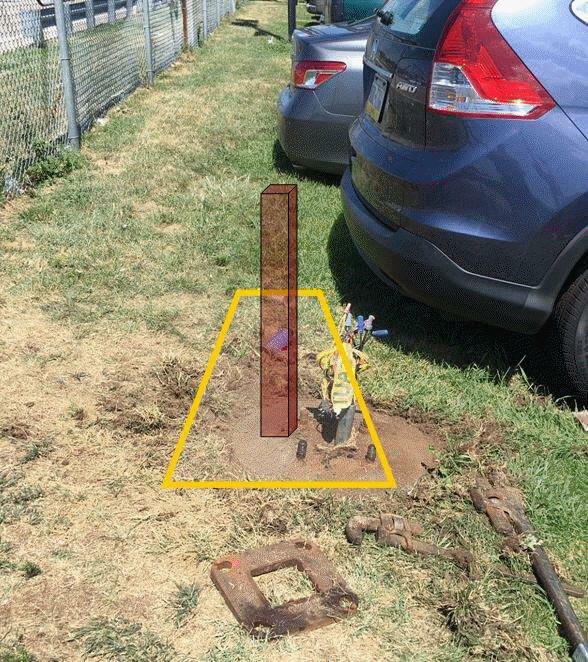 Light pole foundation built to maximize parking space yet built with extra steel rebar and coated with high visible yellow paint. Pyramid Style Lighting Pole Foundations are built special for areas receiving continuous vehicular damage. These were built for large Trash Trucks at their Parking Island. These foundations are reinforced with steel and are meant to be bumped. Proposed diagram of a Pyramid Style Lighting pole foundation. Lighting Restorations - Reconditioning for a fraction of the cost. Light Poles for Shopping Centers. Shopping and Retail - Parking and Security Lighting.